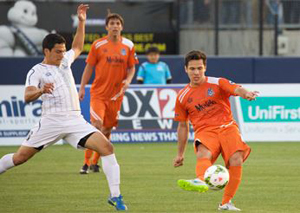 TULSA, OK—The Tulsa Roughnecks have played three games in USL League play and they have yet to find the win column as they dropped their second and third home games to St. Louis FC and the Austin Aztex by identical scores of 2-0 in each game. After an historic sellout draw on opening night with Oklahoma City, the Roughnecks have been taking plenty of shots, but none of them have been finding the back of the net. Last Thursday night Saint Louis FC invaded “Estadio De ONEOK” for a match that counted, (the other two were preseason “friendlies” or exhibitions), and partly on the strengths of former University of Tulsa goalkeeper Mark Pais, the STLFC handed the Roughnecks their first regular season loss. Saint Louis controlled play in the first half hour. Jamiel Hardware hit the post in the 17th minute, and Tulsa keeper Zac Lubin made a pair of saves to keep the game scoreless. The pressure finally paid off just before halftime. Jeremie Lynch, who registered a brace in a 2-1 Saint Louis win in preseason contest at ONEOK Field, was again the nemesis for the Roughnecks. The native of Jamaica opened the scoring with the first goal of the season for Saint Louis in the 42nd minute. It took just ten minutes for STLFC to score again, this time Lynch crossed the ball to Bryan Gaul who knocked home a shot that put the visitors up 2-0. After the goal, head coach David Irving turned to his bench, bringing on a trio of subs that included Oscar Jimenez, Gibson Bardsley and Sammy Ochoa. Bardsley appeared to put the Roughnecks on the board with the team’s second goal in club history but the goal was disallowed by the referee as he had determined that Bardsley had struck the ball with his hands. Despite that, the late game substitutions appeared to energize the Roughnecks offense as they peppered Pais with shots, but the former TU goalie was up to the task. 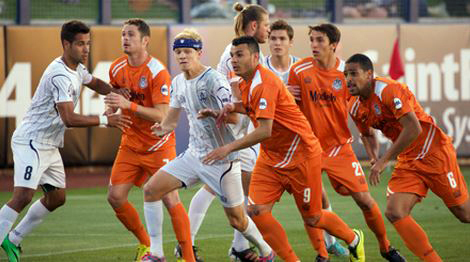 Just 48 hours later the Roughnecks hosted the Austin Aztex and in that match the home side peppered the Austin net with 22 shots but still could not find the netting behind Austin goalie Devin Perales. Missed opportunities from Eli Galbraith-Knapp, Oscar Jimenez, and a header that went just wide by Gibson Bardsley plagued the Roughnecks in the game’s first 45 minutes, despite the fact that they largely controlled the first half. It was spoiled by Aztex forward Kris Tyrpak, who got behind defender Mason Grimes and dribbled around keeper Zac Lubin. His soft shot rolled between the legs of Grimes and settled softly into the net to put Austin in front 1-0 in the 22nd minute. He struck again in the 66th minute when he hammered the ball into the top corner of the net from the 18 yard line to put the visitors up by a pair. It was another game of frustration for Gibson Bardsley as he apparently scored, but the linesman (assistant referee) had ruled offside on the play, denying him a goal for the second time in as many nights. Perales was credited with 13 saves in the game and he helped extend the Roughnecks scoreless streak to nearly 201 minutes. 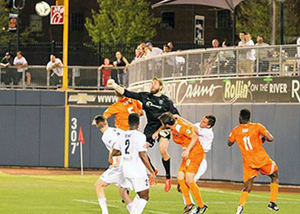 After three games in eight games the 0-2-1 Tulsa Roughnecks FC will be in action again on April 16th when they host the Seattle Sounders 2 in ONEOK Field. This entry was posted in Sports on April 8, 2015 by admin.